Beautiful Dreamer tells the story of an insomniac character up late in their apartment. Their world is not quite ours, though, as we realize little by little. There’s an ancient subterranean shrine in the lot next door, rising gradually from the ground and dislodging the buildings above. There’s a library of unreal literature, and moths who eat books and excrete new stories made of the remains. The story is fantastical, and — like the author’s previous story Magical Makeover — contains some lovely images and turns of phrase. There’s a whole marvelous paragraph on a fey birthday cake, and a good deal of curious and funny dialogue. As the above screenshot might suggest, the game also contains a CYOA-within-a-Twine, a gamebook whose pages you can explore by working through the page numbers. Ingeniously, it allows you to play the gamebook properly or to cheat, peeking at page numbers you haven’t been invited to visit to find easter eggs. Most of all, it is a story about finding comfort in unexpected places and ways — from beings you wouldn’t have expected, from stories and from dreams, from your own store of courage. And while I’m not entirely sure how some pieces of it fit together (I might need to replay for that), I enjoyed the journey very much. 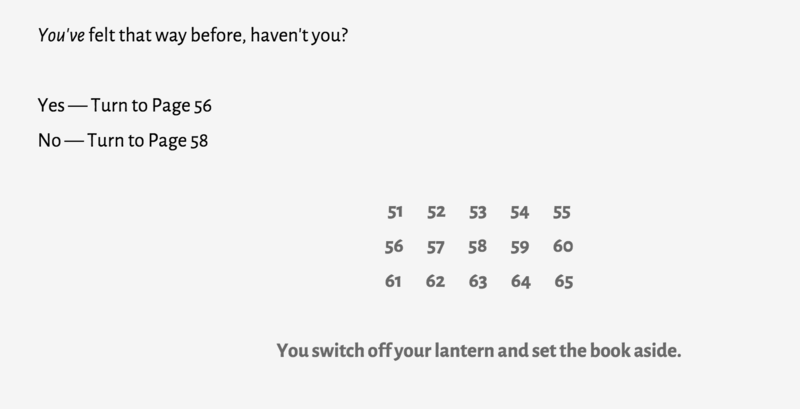 Witches and Wardrobes is a game by Anna Anthropy about getting dressed and getting yourself together enough to go outside. The process of grooming and selecting your clothing is fraught — you’re not quite happy with any of your options, and you are frequently self-critical. These passages echo some of the things Anna has said elsewhere about the challenges of presenting herself in public as a trans woman; many are easy to relate to even without that specific background. The end then flips around the meaning of the whole situation in quite a satisfying way. It’s not a long play, but it made me smile. Winter Storm Draco (play online) is tagged as an interactive documentary. It opens with a framing passage where you rattle away at your keyboard (typing whatever you like) and the game spits out text about this Winter Storm. Then it drops you into the storm setting. A curious thing about Veeder’s games is the way they seldom take place on only one plane of reality. Sometimes that’s because the narrative voice keeps talking to you about the fact that you’re playing the game, chattily responding to your parser errors and the less clever of your puzzle solutions. Sometimes it’s because he’s using framing devices, like the flashback in Dial C for Cupcakes. Sometimes it’s because, as in Island of Doctor Wooby or Nautilisia, the metaphorical and the literal coexist and you can sort of interact with both at the same time. The result is a sense that the game isn’t taking itself at all seriously — and indeed a lot of the fun of Veeder’s sense is the playfulness of the narrative voice. His Patreon even carries the subtitle “interactive fiction to distract you from your problems”. Get your silly escapism here! But alongside the jokes and fantasy, there’s often a sense of understated purpose about his work. The Ascent of the Gothic Tower feels like a somewhat dark depiction of the IF-playing mindset, for instance. Winter Storm Draco, on the other hand, goes through snow and dark and night and comes out again on the other side. I found it quite comforting. There is an awful lot of snow and ice described in the game, so if you sit down to play this thing, I suggest setting yourself up with some hot apple cider or maybe a nice mug of cocoa first. If you need something even more cuddly — or on point — than these, see also Games of Comfort and Consolation from last year, Anna Anthropy’s single-player RPG A Wish for Something Better, or possibly Carolyn VanEseltine’s Practice Mode. This entry was posted in CYOA, game lists, interactive fiction, non-review, parser, Reviews and tagged anna anthropy, beautiful dreamer, ryan veeder, s woodson, winter storm draco, witches and wardrobes by Emily Short. Bookmark the permalink. Thanks for the recommendations as winter is a dark time for me but I enjoy playing IF. i really appreciate recommendations like these (not just because one of them’s mine) because i feel like the game i want most of the time is the kind i can sit with on a quiet evening with a big cup of tea, like a comforting novel. i’m going to play beautiful dreamer (with tea!) tonight, i think. This anti-sadness-cabinet idea is great! I will do this, and I will go as far as putting >OPEN CABINET on the door.